The annual average fogs for Wellington Airport is 6 fogs per year, much rarer than at Christchurch (50 days per year) or Dunedin Airport (64 days per year) or Hamilton (92 days per year), yet it is very disruptive when it does roll in off the sea and can last for hours at a time. Interestingly, Wellington gets more fog days in summer while fogs occur in winter for many other airports. Wellington airport is a hub for domestic commercial air traffic, therefore even short closures have major flow on effects for passengers and other airports around the country. Radiation fog is very rare at Wellington airport. It is much more common in Hamilton or on the Taieri Plains near Dunedin. It can happen in the upper reaches of the Hutt Valley, but can only reach the airport from there if a northeast wind can push it south over the harbour after it has formed. Advection fog develops when air moves over a cooler land or sea surface, either by warm humid air passing over cooler waters, or by maritime air passing over cold surfaces at night. Wind mixes the colder surface air up and carries the fog to greater heights. These fogs are often thicker and more persistent than radiation fogs. Most fogs at Wellington airport are advected onto the airfield with a light southerly surface wind, usually a sea breeze. The airmass has usually come from relatively warmer latitudes to the northeast of New Zealand. As the air passes the bottom corner of the North Island it passes over a colder sea surface which causes the air to cool and become saturated, causing fog to form. 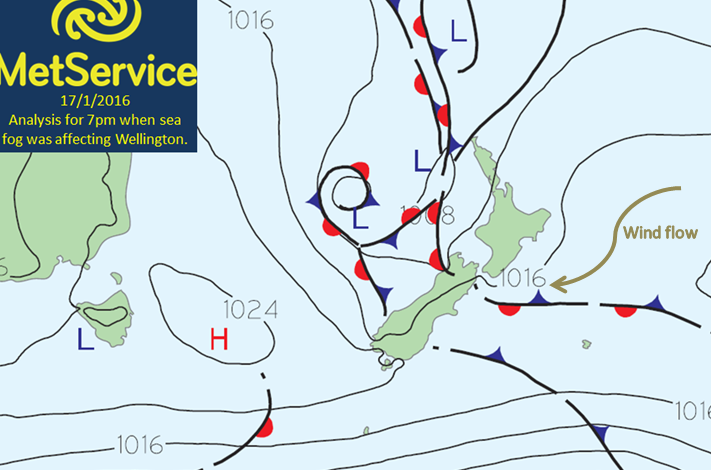 For this reason the winds are sometimes called "round-the-corner southeasterlies" as they result from northeasterly winds off the east of the North Island bending around Cape Palliser to enter Wellington Harbour as a south-southeasterly. This situation occurs when there is a deep low to the northwest of Auckland and an intense anticyclone somewhere near the Chatham Islands. The northeasterly air stream between these two features has usually come from subtropical regions, making the air warm and moist. This moist air cools as it comes south, and its relative humidity increases to a point where low cloud, or possibly fog, forms (standard sea fog formation). Often it is not easy to tell if there is sea fog off the Wairarapa or Hawke Bay coast - ship reports there are rare and satellite imagery is the only way. Image below shows a "Round the corner southeasterly" situation at Wellington airport. Image from New Zealand Flight Safety article June 1990, written by Erick Brenstrum, MetService Expert Meteorologist. As long as there is an upper easterly wind greater than about 20km/h, Wellington airport is protected from fog. This is because the air dries out as it crosses the Aorangi Mountains, creating a boundary between fog or low cloud to the south, and clear skies over Wellington airport. The wind must turn southerly over the city and hills for the fog to reach the airport. So the smallest shift in wind direction and the wind strength is critical in forecasting whether sea fog will affect the airport. Sometimes fog is visible drifting into the Harbour entrance 1-3 hours before it affects the aerodrome, especially on days where the air temperature is much warmer than the sea. It is important to remember that even if the sea fog does not affect Wellington airport itself, the presence of fog through Cook Strait and the western Sounds is critical for anyone planning recreational boating or kayaking, as visibility can suddenly be limited to a few metres in dense fog. The clearance times of these fogs is notoriously difficult to forecast and will quite possibly depend on a very subtle change in the flow direction rather than a major air mass change. Thanks to Erick Brenstrum for his advice and input into this blog.